Task: Hey, I have got four eyes buy trust me, i can't see. The Unbeatable Game - IQ (TUG) Level 21 Walkthrough, Solution, Answer, Cheats for Android, iPhone, iPad, iPod. Note: This is "The Unbeatable Game - IQ" by "Architect Games LLC"
Is your level different? Check the Main Index Page for all the answers in one place. Solution: Cut the rope exactly in the middle. The Unbeatable Game - IQ (TUG) Level 20 Walkthrough, Solution, Answer, Cheats for Android, iPhone, iPad, iPod. Solution: Count = 5 (odd), the = 3 (odd), number = 6 (even), of = 2 (even), odds = 4 (even), here = 4 (even). So there are just 2 odds. The Unbeatable Game - IQ (TUG) Level 19 Walkthrough, Solution, Answer, Cheats for Android, iPhone, iPad, iPod. Solution: Use 2 fingers and tap the words "the" and "order" in the question. The Unbeatable Game - IQ (TUG) Level 18 Walkthrough, Solution, Answer, Cheats for Android, iPhone, iPad, iPod. Solution: Just tap them in ascending order. The Unbeatable Game - IQ (TUG) Level 17 Walkthrough, Solution, Answer, Cheats for Android, iPhone, iPad, iPod. Solution: You can rotate the arrows using two fingers. The Unbeatable Game - IQ (TUG) Level 16 Walkthrough, Solution, Answer, Cheats for Android, iPhone, iPad, iPod. Task: If you are enjoying the app, please proceed. Solution: Tap the smiling face. The Unbeatable Game - IQ (TUG) Level 15 Walkthrough, Solution, Answer, Cheats for Android, iPhone, iPad, iPod. Task: What you get when you go uphill, then downhill and go across in the middle? Solution: You get the letter "A". The Unbeatable Game - IQ (TUG) Level 14 Walkthrough, Solution, Answer, Cheats for Android, iPhone, iPad, iPod. Task: Remove the key from Donkey. Solution: Drag the letters "key" from the word "Donkey" in the question. The Unbeatable Game - IQ (TUG) Level 13 Walkthrough, Solution, Answer, Cheats for Android, iPhone, iPad, iPod. Solution: Tap the exact middle of the rope three times. The Unbeatable Game - IQ (TUG) Level 12 Walkthrough, Solution, Answer, Cheats for Android, iPhone, iPad, iPod. Task: The below figure is a right angle triangle. Find Z. Solution: Tap the "Z" inside the triangle. The Unbeatable Game - IQ (TUG) Level 11 Walkthrough, Solution, Answer, Cheats for Android, iPhone, iPad, iPod. Solution: Tap the button when the green light is on. The Unbeatable Game - IQ (TUG) Level 10 Walkthrough, Solution, Answer, Cheats for Android, iPhone, iPad, iPod. Task: What time is it? Solution: It's 2 AM, because owl are awake at night. The Unbeatable Game - IQ (TUG) Level 9 Walkthrough, Solution, Answer, Cheats for Android, iPhone, iPad, iPod. Task: An organism, when in the morning, has 4 legs, when at noon it has 2 legs, and in the evening has 3 legs. What is it? The Unbeatable Game - IQ (TUG) Level 8 Walkthrough, Solution, Answer, Cheats for Android, iPhone, iPad, iPod. Task: Tap the number which should replace the ? Solution: The last but one number of every row is formed by multiplying the last number of the current and previous row. So the answer is 5x1=5. The Unbeatable Game - IQ (TUG) Level 7 Walkthrough, Solution, Answer, Cheats for Android, iPhone, iPad, iPod. Solution: Tap the "6" on the top right corner. The Unbeatable Game - IQ (TUG) Level 6 Walkthrough, Solution, Answer, Cheats for Android, iPhone, iPad, iPod. Task: What comes next to december 31? Solution: Well in the question next to december 31 is "?" so tap it. The Unbeatable Game - IQ (TUG) Level 5 Walkthrough, Solution, Answer, Cheats for Android, iPhone, iPad, iPod. Task: What relation is your nice's brother to you? The Unbeatable Game - IQ (TUG) Level 4 Walkthrough, Solution, Answer, Cheats for Android, iPhone, iPad, iPod. Solution: Blow into the microphone of your phone. The Unbeatable Game - IQ (TUG) Level 3 Walkthrough, Solution, Answer, Cheats for Android, iPhone, iPad, iPod. Solution: Tap "Bicylce" in the question. The Unbeatable Game - IQ (TUG) Level 2 Walkthrough, Solution, Answer, Cheats for Android, iPhone, iPad, iPod. Solution: Just shake the device to break the glass. The Unbeatable Game - IQ (TUG) Level 1 Walkthrough, Solution, Answer, Cheats for Android, iPhone, iPad, iPod. The Unbeatable Game - IQ (TUG) walkthrough, cheats, solutions for all levels, available for android and ios devices. TUG is an IQ measuring game, that will determine your intellect by challenging you to solve a series of tricky puzzles. All the 165 questions/puzzles in The Unbeatable Game are unique and some of them will really make you scratch your head. If you are getting frustrated because you cant figure out what's the solution to one of the levels, you found the right page. Below you will find the solutions, with pictures, for all 165 levels, just pick the one you want. Unfortunately the levels are randomized on each device, so just use Ctrl + F and search for the question you want, than tap the level number if you want to see the image with the solution. Task: The kiwi is sleeping. Try waking her up. Solution: Drag the moon from a side of the screen and slide it inside the circle. Task: Quickly find what you see in the middle of the sea? Solution: Drag the letter "e" from the word sea in the question. Solution: Select "/" because 545+5=550. Task: Count the no: of island rails on the tree. Solution: Shake the phone and you will see 5 Island Rails on the tree. Solution: Orientation must be ON to pass this level, just flip the phone to break the egg. Task: Complete the analogy 15:10:5:?. Task: Find the error in 24 hour clock system. Solution: On a 24 hour clock the correct time is 00:00AM not 12:00AM. Solution: The answer is -1. Task: Make 100 less than 1. Task: Remove one matchstick so that, we can form just 3 squares. Solution: Remove any matchstick from the cross in the middle. Task: Which of the figures below can be found by rotating the figure above? Solution: Any river is in LIQUID state. Task: The word CANDY can be spelled using 2 letter. How? Solution: C and Y. Drag them from the word "candy" in the question. Solution: Remember! Tap the red balloons first, then the green balloon and twice the blue heart. Solution: SEVEN, EIGHT, NINE, TEN, ELEVEN, TWELVE, THIRTEEN. Task: Again try making 100 less than 1. Solution: Erase "1" from 100 with your finger. Task: I work 24*7,7 days a week 365 days a year with no break, no leave, yet i don't get paid. Who am I? Task: Which is the most lively part of Russia? Solution: Blue is the predominant color, so tap the BLUE button. Task: Try to remove the man's hat. Task: How many legs does this elephant have? Task: Who is silent in the Parliament? Solution: The letter "a" is silent in Parliament. Solution: Just tap the strawberry fruit 3 times. Task: Hide the dark cloud. Solution: Just cover the cloud with your finger, for a few seconds. Task: I am very heavy forward, backward I am not. Solution: Write "ton" by using the letters form "not" in the question. Task: It's time to move to the next level. So proceed. Solution: Just swipe the page to pass the level. Solution: Tap the mosquito several times to kill him. Task: What is the minimum number of lines required to divide the crescent into 5 parts? Task: Lock the fish with in the frame. Solution: Drag the frame in the direction of the fish path to lock the fish. Solution: Spin the phone counterclockwise to open the box. Task: Go back to the previous question. Solution: Swipe down using two fingers. Solution: Swipe up 2 times up using 2 fingers. Task: A delicious Pizza with a crust thickness 'a' and radius 'z'. What is the volume of the Pizza? Solution: Pi*z*z*a. Drag Pizza from the question. Task: Tap which is near to us? Solution: "?" is the nearest thing tu "us". Task: Which of them is hot? Solution: Merge the squares in the second row, in the gaps provided in the first row to make the rectangle. Task: Hoe can you put three cows into nine stables? Solution: Fill the 9 boxes with the letters "three cows" form the question. Task: Complete the level by charging the battery. Solution: Plug the charger into your phone. Task: I am something which has roads but not cars, rivers but no water, hills buy no trees, places but no houses. Who am I? Task: Tap the smallest fish. Solution: Tap the word fish in the question. Task: Make the frog jump. Solution: Use the stick to shake all the bushes around the frog (takes some time until you complete the level). Task: Can you find the mistake? Solution: It's 'su' instead of 'sa'. Task: The smoking alarm is buzzing. Help! Solution: Rub the smoke and the alarm will stop. Task: What occurs once in a day and in a year, but never in a week? Task: How can you change centimeters to meters? Solution: Erase "centi" from centimeters. Task: Tap quickly to move to the next question. Solution: Just tap the word "quickly" in the question. Task: Straighten all the lines. Solution: All the lines are straight. Just tap the confirm button. Task: Form a small square. Solution: Tap the center of the cube. Task: Release all of the balloons. Solution: Slice all the balloon strings with a single swipe. Task: Prove <-> = unidirectional. Solution: Erase "uni" from unidirectional. Task: Which of these is nearest to us? Solution: Tap the Sun, Moon and Star because all are equidistant to the human. Task: What is opposite to nitrate? Task: Tap the circle two times. Solution: Tap red circle once then the word "circle" in the question. Task: Form the smallest number. Solution: Take the "." form the question and place in front the number to make ".999999". Solution: Split the clouds to stop it. Task: Find the angle marked with letter? Solution: Tap the angle beside the letter "a". Task: Who is smart here? Solution: Yourself, because all of the other ones are dead, so they can't play the game. Task: How many holes does this bucket have? Task: Tap the smallest number. Solution: Put everything inside the bin, even the question. Task: Who is having brain here? Solution: Tap all the 3 heads at the same time. Task: Tap from highest to lowest number. Solution: Tap the number based on their height not value: 91, 95, 100, -100, 20, 0. Task: Quickly tap proceed to go back. Solution: Just don't touch the screen for 5 seconds. Solution: Split the dotted triangle to form 2 more triangles. Now you can fit the objects. Task: Tap the different frog. Solution: Tap the word frog in the question. Task: Break the ice cube. Solution: Use 2 fingers and slowly lift the ice cube, now release it and it will break. Solution: Tap the words "all" and "colors" at the same time. Task: Tap the correct equation. Solution: Invert your device and tap the equation. Task: How many pairs do you see? Task: Help sandy get away from the bathing tub. Solution: Just drag the bathing tub away from Sandy. Task: Find and tap the center of the earth. Solution: Tilt your device to find Earth. Then tap the center of the earth. Solution: Drag "|" from + and place it on 6 to create 8-8=0. Task: Take the elevator up. Solution: Just press the confirm button. The elevator has already reached the top floor. Task: Make the floor dirty. Solution: Shake the device to spill out it's contents. Task: Tap the green button exactly four times. Solution: Tap the green button twice. Swipe the brown button to get the green button back and then tap the two more times. Task: Pick up the pencil. Solution: Flip the device as if you just picked up the pencil. Pick up the pencil. Task: Erase all the dots. Solution: Drag and place all the dots beside the dot present in the IQ. Task: Tap all which are divisible by 2. Solution: Tap 2 and 8. Then rotate the phone to make 9 look like 6 and tap it. Task: Force the diver beneath the lake. Solution: Just drag the lake above the diver. Task: Cut the rope opposite to black color. Solution: Cut all the ropes except the BLACK and PINK ropes. Solution: Drag "-" to the side and then tap on 4 to make "-4". Task: Drive the car forwards. Solution: Hold the bottom-right corner of the screen, like you would press the accelerator pedal. Task: Now drive the car backwards. Solution: Tap and hold the bottom-left corner of the screen. Task: Great! Now Drive the car uphill. Solution: Tilt the device 90 degrees (car pointing up) and press the bottom-right corner. Task: Great! Now try and drive the car downhill. Solution: Tilt the phone 90 degrees down and press the backward button. Solution: Drag the sugar cane to the corner of the screen and the elephant will move. Solution: Holding the device in front of you, rotate it 360 degrees. Task: Try to lift the weight plate. Solution: Use 2 fingers, hold each side of the weight and lift it up to the top of the screen, hold it there a few seconds and release. Solution: Drag "!" and put it at the end of the sentence to make: "No! He yelled. Do it now!". Task: Point the arrow down. Solution: Flip the phone 90 degrees downwards. Task: What was the weight of the weight plate? Solution: Flip the phone to make the triangle look like an inverted triangle. Now tap the inverted triangle until the battery is discharged. Task: You have entered a dark cave with only one matchstick. Which one will you light first? Solution: The matchstick! So tap the word "matchstick" in the sentence. Task: Tap only the green circle. Solution: Move the yellow box aside and tap the green circle. Task: Spell the name which is warm when it is wet. Task: Move only the vegetables into the circle. Solution: Tomatoes are considered fruits, so drag only the potatoes and carrots inside the circle. Task: Take the picture of the human. Solution: Scroll down through the pictures and take the picture of the human. Task: What ended in the second millennium? Task: Again, try to make the arrow point us. Solution: Slide the arrow till it's pointing to the word "us" in the question. Task: What fraction of letters are bold? Solution: Drag the line an put it exactly in the middle to divide the bold from the light letters. Task: Make the arrow point you. Solution: Tilt the device such that the head of the arrow points you. Solution: Start from the bottom and bring the 4 pieces together to form the circle. Task: Fold the paper exactly into 2 parts. Solution: Flip the phone completely, making it face the ground (just like you would do with a piece of paper). Task: Put on the cap. Solution: Lift the phone up and flip it as if it were a cap. Task: Switch ON the light in the shed. Solution: Drag the sun and place it above the solar panel to charge it. The light switches ON the moment the solar panel is charged. Task: Again try lift this. Solution: Just lift the word "this" in the sentence. Task: Tap all the right hands. Solution: There are only 2 right hands, nr. 1 and nr. 4. Task: Help James cross the road. Solution: Drag the road to the left of the screen. Solution: Erase the moke on top of the milk. Task: Tap all the small ants. Solution: Careful, after you tap 2 small ants, the question changes to - Tap all the big ants. Task: James has 380 candybars. He ate 373 of them. What does he have now? Task: Locate the damages in the circuit. Solution: Tap all the damage parts on the circuit as well as the word "circuit" in the question. Solution: While holding the word "shift" tap "b"to get "B". Task: Open the geometry box. Solution: Holding the bottom of the box, open the upper lid to open the box. Solution: Just tap confirm button. The elephant never jumps. Task: Remove the damaged tyre. Solution: Tilt the phone upwards from left and rotate the phone as if you were removing the damaged tyre. Solution: Drag the Sun from any side of the screen to kill the vampire. Task: What day is it today? Task: You are doing well. Do you know what is your score? Task: Let the balloon go far away. Solution: Zoom out to the maximum. Task: Drag the shark to the ascent point X. Solution: Drag the word "acent" from "ascent" in the question and put it near the "x". Task: Let there be happiness and joy. Solution: Tap in this order: ORANGE, RED, YELLOW, GREEN. Solution: Tilt the phone anti-clockwise to 90 degree position. Task: How many squares can you figure out? Solution: Drag the word "emergency" from the IQ and place it between the arrow and the exit in the figure. Task: Pour some water in the jug. Solution: Lift the glass using your finger and get it close to the jug. Now incline the phone towards the jug. Solution: Dr. awkward. Tap "dr." and "awkward" in the question. Task: You have come so far! How many stars can you give? Solution: Tap at least 4 stars to pass this one. Solution: Drag "or" from IQ and place it in the blank space. Task: John is a positive character. He is soft, kind, helpful, caring and a loving person. What do you think his blood group can be. Solution: Tap "a" and "positive" in the question. Task: Press and hold the button. Solution: Drag the finger down from the top of the screen to press and hold the button. Task: Find and show the cats nail scratch in moses lake Washington. Solution: Just tap the 2 inverted quotes (") in the IQ. Solution: Drag the finger down from the top of the screen to press the bug spray and kill the bugs. Task: Prove that the line is of a finite length. Solution: Drag the line and place it in between the IQ to prove the line has a finite length. Task: Try burning the dry glass. Solution: Place the Sun in such a way that the rays penetrate through the magnifying glass to burn it. Solution: Drag the bulb holder all the way to the right of the screen, than drag the bulb into the holder. Task: The escalator is moving down. Prove it. 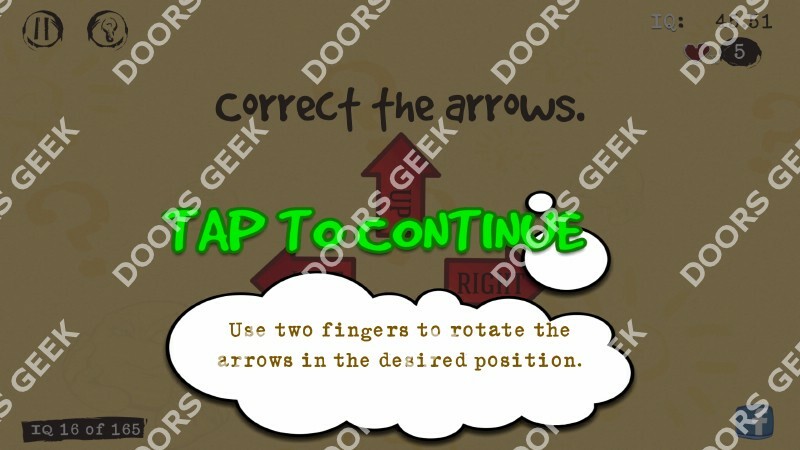 Solution: Rotate the device such that the arrow points down. Solution: Cut the rope so that the cage falls. Task: Turn off the light. Solution: Rotate your phone as if you were unscrewing the bulb from it's socket. Solution: Flip the phone completely to throw the ball away from the screen. Solution: Erase "n" from 1/n and from the word "sinx" to get six = 6. Task: Time to celebrate. Open the champagne bottle and party hard. Solution: Just shake the phone.